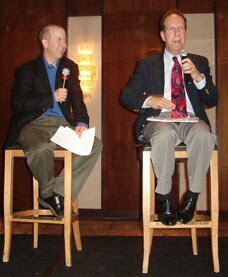 I had the recent good experience to work with good pal and fellow corporate comedian David Glickman where we both presented programs on humor and comedy technique to the Northern California chapter of the National Speakers Association. But the highlight was hanging with David. 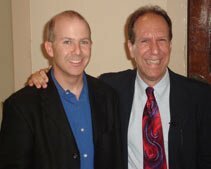 He’s a good friend, and because we both are corporate comedians and humorists we have a ton in common. One of our favorite things to do —and this is true with all speakers and comedians — is to share stories from the road. What happened that was funny? All the crazy things that have happened to us on stage are always a point of conversation. But most of all.. it was just hilarious. Of course all comedians and speakers have things go wrong; but it is somehow refreshing to hear those stories. It makes us all feel more human. Feel more normal. Thanks David. And thanks NSA- California. It was a blast. Technorati Tags: Comedians, Motivational Speakers, Humor, Comics. https://www.bradmontgomery.com/wp-content/uploads/2018/11/logo-1-495x198-1-300x120.png 0 0 admin https://www.bradmontgomery.com/wp-content/uploads/2018/11/logo-1-495x198-1-300x120.png admin2006-06-03 21:05:292006-06-03 21:05:29Comedians' Failures are Hilarious.